You are here: Home / Cocktails / Healthy Eggnog with Marshmallow Vodka! My boyfriend bought me marshmallow vodka for Christmas last year and I love it more than anything. But it’s a weird kind of love, you know? Weird like I love it so much I want to pour it into every drink I make. And weird like I love it so much I never want to use it so it lasts forever and ever. I’m hoping he buys me another bottle this year so I can start making everything a little more marshmallow-y. But in the meantime, I’m spiking my glasses of healthy eggnog with it like crazy because it’s coming up to Christmas and…yeah, that’s my only reason. Do I really need a better one? I love coming up with creative cocktail recipes, and can literally lose hours researching awesome new vodka flavours. Have you seen some of the stuff they come up with? The flavours start off pretty tame, like watermelon vodka then move onto blue raspberry vodka. If anyone knows the difference between ordinary raspberries and blue raspberries, I’d love to know. The only raspberries I get are the frozen ones and I know for sure they’re not blue! One type of vodka I so, so want to try is the whipped cream vodka. Can you imagine how good that must taste?! 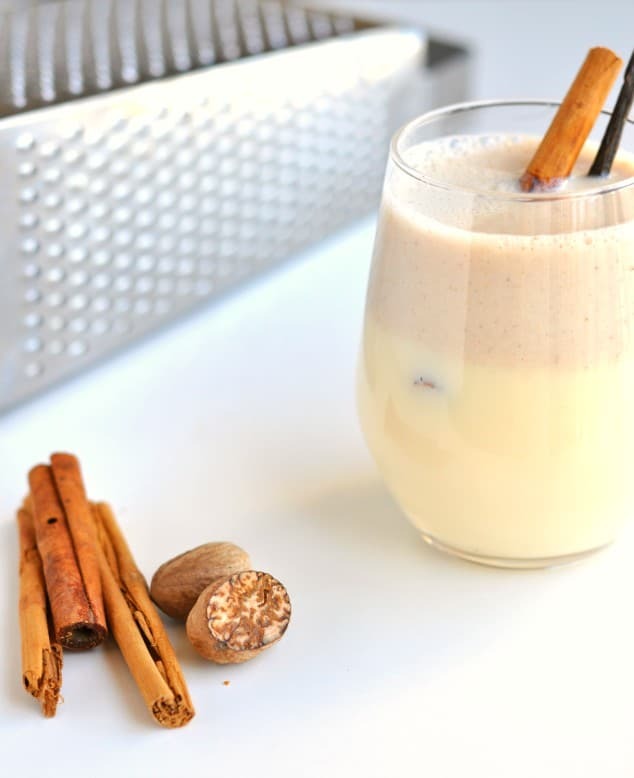 I bet it would almost be as good as the marshmallow vodka in this healthy eggnog…almost. 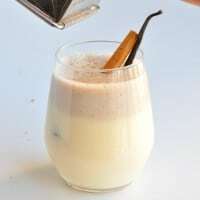 If you’re not a big vodka fan, you can 100% make this healthy eggnog recipe without the marshmallow vodka and enjoy it just as much. And better yet – if you do pass on the vodka, the Christmas drink comes in at just 150 calories – whoo! 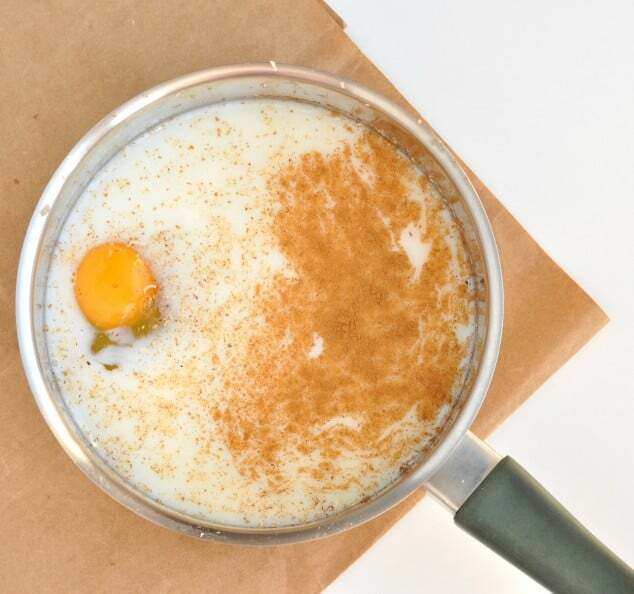 Even though it contains no cream and just 1 egg, it’s got the most delicious smooth, creamy, velvet-like texture. It kind of reminds me of a white fluffy winter jumper I own. Except in a glass. And that’s a totally normal thing to say, right? P.S. If you don’t go down the marshmallow vodka route, let me know what fancy stuff you put in your eggnog to take it to the next level! 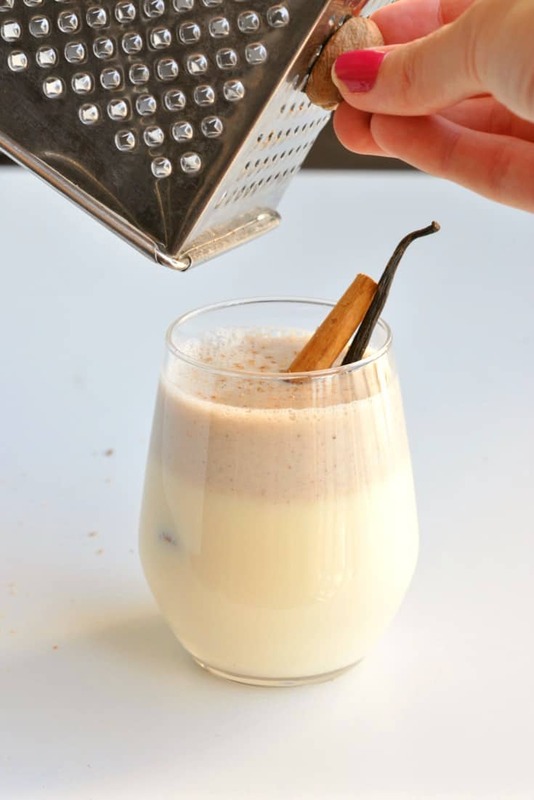 A rich and creamy healthy eggnog brought to life with a shot of marshmallow vodka! Seriously - this is the stuff Christmas dreams are made of. Place all the ingredients, except the marshmallow vodka, into a small saucepan over a medium heat. Whisk constantly for 10 minutes until the cocktail is piping hot and thick. Pour into a serving glass and stir in the marshmallow vodka.